Proving once again you don’t have to be big to be powerful introducing the Flexzilla Pro Mini Impact Wrench. It packs 550 ft-lbs. 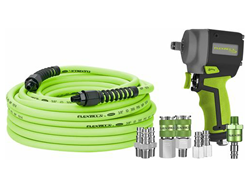 of working torque into one of the lightest, most compact air tools on the market. Letting you get into tight spaces where full-size impact wrenches just don’t fit. Plus, it delivers up to 800 ft-lbs. of nut-busting torque to convince even the most stubborn rusted nuts to break free. Flexzilla features an ergonomic grip with a patented forward/reverse toggle switch and torque selector that allows easy one-hand operation.